This weekend there were two celebrations. TWO. Both in Chicago. Two hints: One party was about age and the color related to the other party would best be matched with white. Give up? 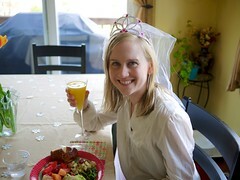 Okay, I'll tell you....Grandma Ruth had her 90th Birthday and I had my first ever Bridal Shower! Woohoo Party! The West Coast O'Neill family headed out to Chicago for these big celebrations. The whole gang arrived in Chicago on Friday evening (although my mom got their earlier in the week to meet up with friends and spend extra time). The first stop, dinner at Gale Street Inn, of course. My family is extremely, and I mean extremely, predictable when it comes to Chicago visits. The first dinner is always ribs at Gale Street. The other predictable stops include Lou Malnati's (or sometimes Ginos East), Hackneys and Portellos. Saturday was the party day. 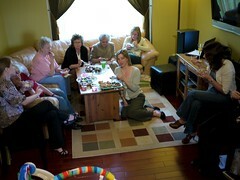 The fun started at 1pm at my cousin Erin's home. 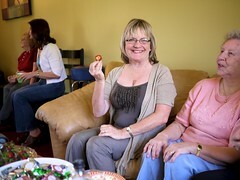 It was so great to see everyone come over from all over to celebrate. We had a jolly good time. Considering it started at 1pm, we began with a tasty lunch. We had a trio of salads - strawberry, spinach, goat cheese salad, fruit salad, and curried chicken salad. Yum! Then we had some fun games - what's a shower without those games everyone loves?! We played the guess that famous couple game, the bride's favorites, and then I had to test my knowledge about Josh. I got 13 out of 20 right. That may sound bad, but some where things Josh didn't even think about before (I asked him afterwards, and he was like, "I don't even know!"). How can you get something right when the person the question is about doesn't even know. I do pride myself on some of the right ones those (that, or it's sickening how right I was). For instance, his favorite food. Anyone who knows Josh, knows this question should be what Josh does NOT like! I have a little secret...I sort of like these games! Next up: dessert! 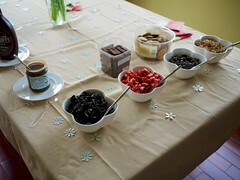 The hosts sure know me because it was no other than frozen yogurt with a toppings bar - a froyo store at home! How freakin' awesome is that?! Not to mention my favorite flavors cookies 'n cream and peanut butter were present. I had to go back for seconds. We wrapped up the party with gifts (pun intended there). I got tons of gifts. It was a cooking themed shower so I got some great recipes. In fact, I'm trying one out - a chicken marinade (it's in the frig now). I got all sorts of great kitchen gadget and tools to better my cooking efforts in the kitchen. To name a few: dutch oven, cutting board, cookie press, bowls, and then nice plates to put all this food on. 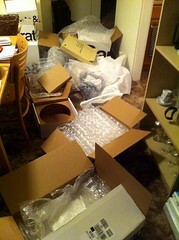 Since I was just visiting, everyone was sweet enough to send the boxes to my house. Yes, they have been piling up. I kept looking longingly at the pile of boxes as mounted higher and higher the past weeks (I tore through them when I got home). Kitchen fun coming!! The shower was super fun and better yet, I got to see lots of my family. 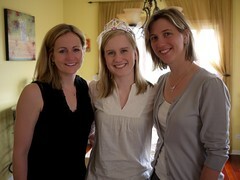 :) Thanks Erin, Aunt Ann, Beth, Aunt Jan, and everyone else who helped make it a great shower! We all headed out from the shower directly to Hackney's for some more celebrations. Woot Woot! This time all the guys joined in the fun for some hamburgers and family time. We had around 30 people to join Grandma in celebrating 90 years. 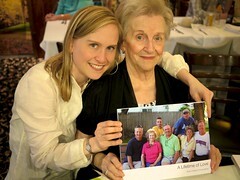 Since Grandma loves pictures, I decided to put together a photo book for her (using my iMac). It warmed my heart to see her ask, "is it really for me?" Twice! (Okay, that might be memory, but still. But I did see her going through the book when we picked her up the next day...). I also put together a slideshow to put out for everyone to watch (watch it now). It was on top of the table that displayed all her birthday cards. And she had a LOT of card (my mom tried to get as many people to send them to her - cute!). There were speeches and story telling, babies running in circles (literally, in circles, it's call catch me), laughs, and hugs. The party really turned out great. I hope (and think) Grandma felt loved. Grandma Ruth's 90th Birthday from Heather O'Neill on Vimeo. 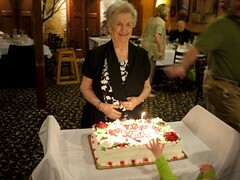 Grandma blows out the candles on her 90th Birthday. The whole family got together to celebrate this weekend (4/30/11). What a drag; no parties! Sigh. Just kidding. I think everyone was wiped out from all the partying. We're wild ones, us O'Neills. Sunday was a day for Josh and me to meet up with Uncle Chuck to not just see him, but prepare for the big day. We meet up for lunch and some chatting. Then we finished the night celebrating (fooled you! we don't stop) my Uncle Mike's birthday. We went to Uncle Mike and Aunt Ann's home in Crystal Lake for Chicago pizza. And that my friends, is how you party. O'Neill's know how to party-party. P.S. You know me, there are TONS more pictures to check out. GO HERE.